Last week we took a break from our regular learning time activities and schedule. Operation Christmas Cookies commenced! The kiddos spent the week researching, planning, preparing, baking, and decorating hundreds of cookies. It was quite the project! 3. Christmas Cookie Deliveries to Community Helpers. SO MUCH LEARNING takes place as we do this! If you've ever wondered what one can learn from the process of selecting a recipe, reading through it, finding ingredients, baking, decorating, arranging, and serving, I've made a fabulous list, broken down by subject. I'm sure I've missed some. For those looking for speech and occupational therapy activities, baking is the ultimate task, requiring muscle coordination & strength, fine motor skills, sensory integration etc. I could go on and on. Over the course of the week, we reviewed so many lessons and skills. This doesn't even take into consideration the research and preparing that went into this task. 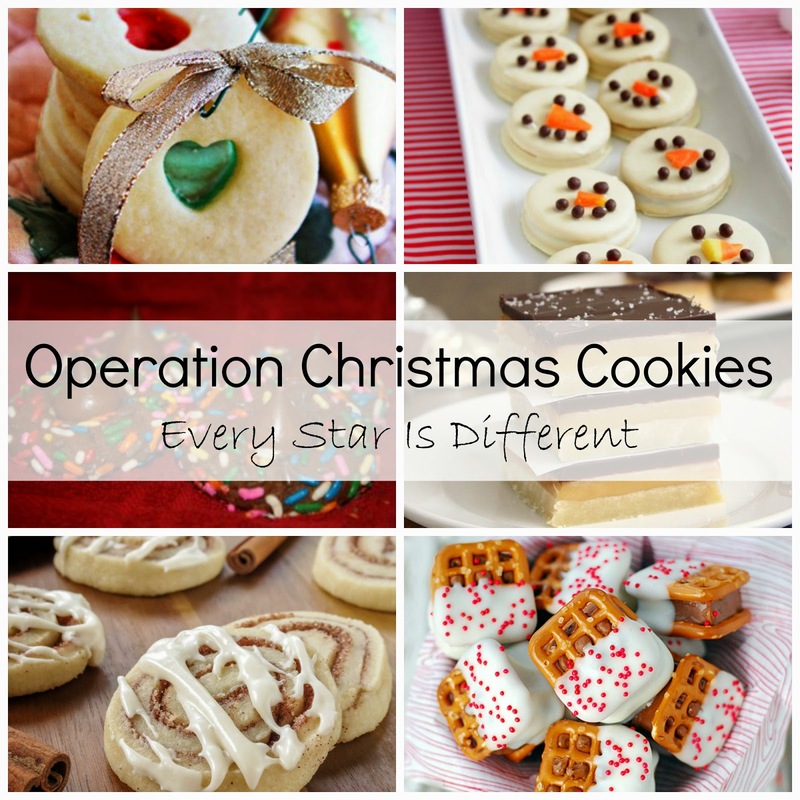 Each older kiddo was asked to come up with six different kinds of cookies they wanted to include in our Operation Christmas Cookies. I chose six because I knew how many cookies we would need, but also to encourage them to try new things. 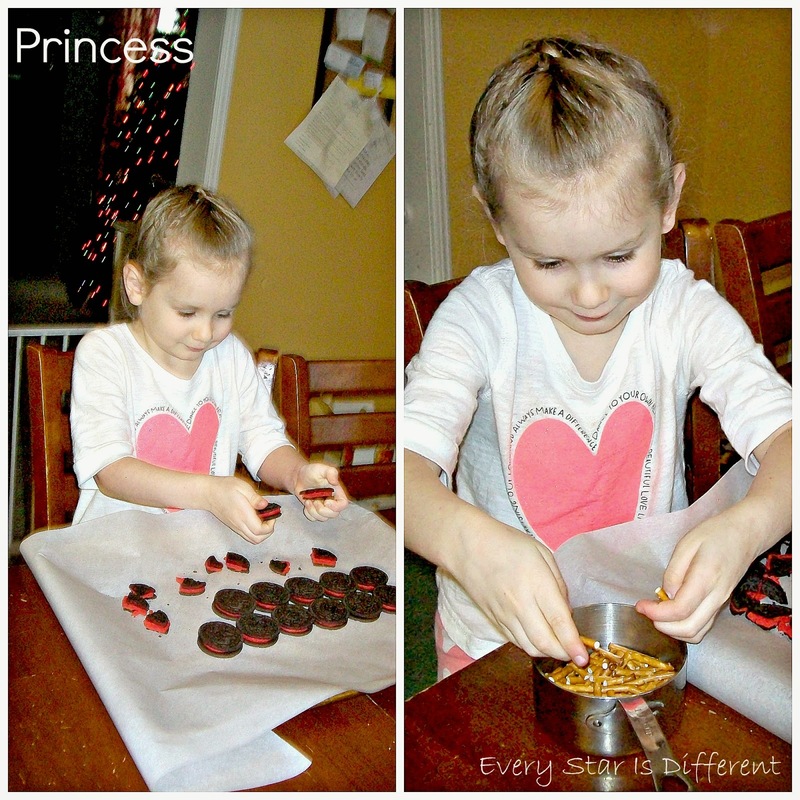 Each kiddo spent no less than 30 minutes on Pinterest looking for cookies they may enjoy. (Pinterest is such a good visual tool to help kiddos learn planning skills.) 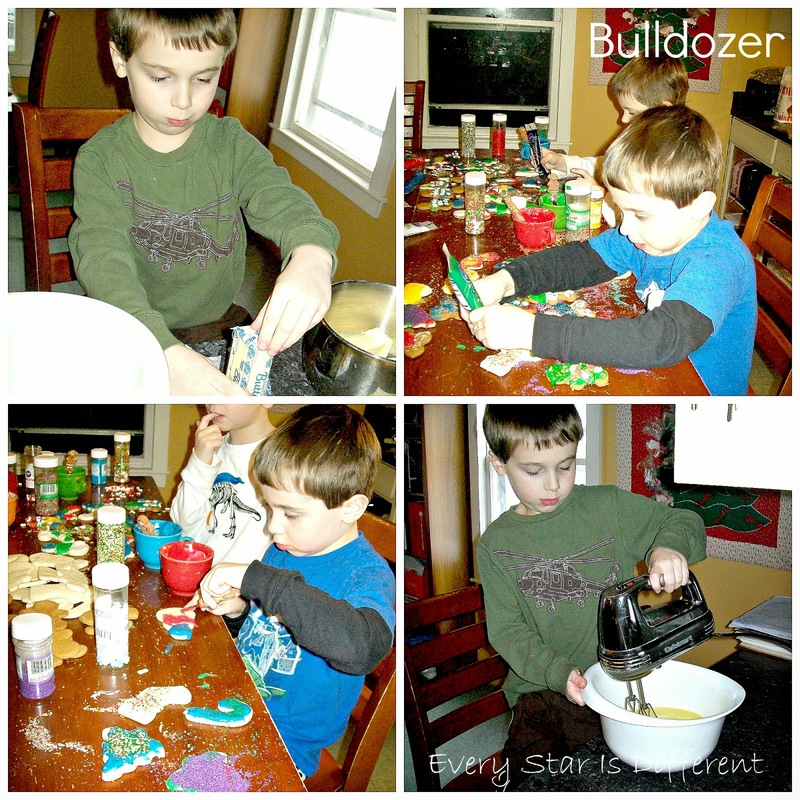 Bulldozer had the extra task of making sure cookies would be safe for him with his food allergies. 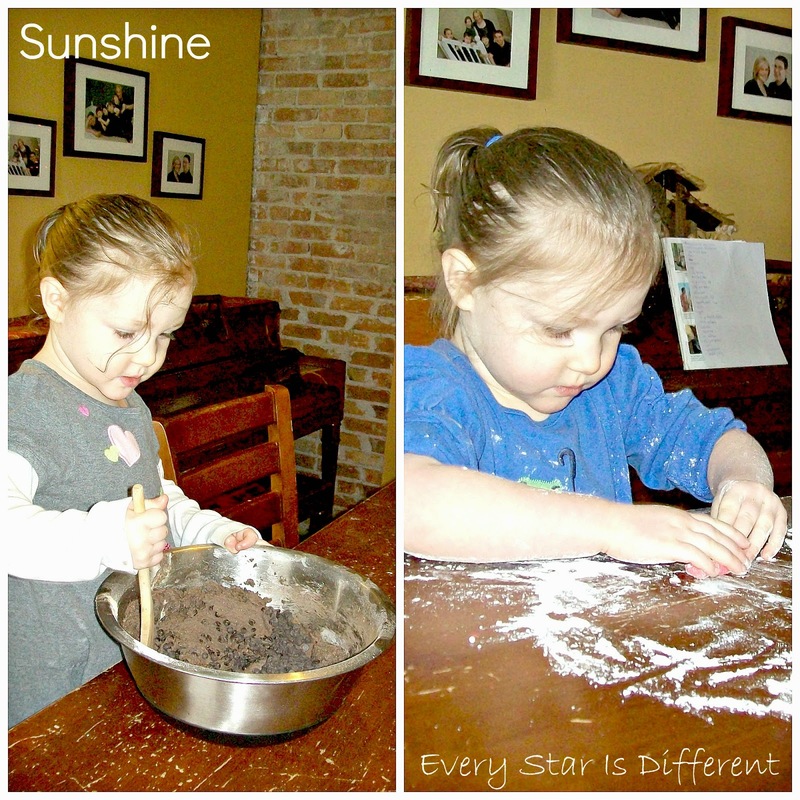 Sunshine chose two kinds of cookies that she could eat from four choices I gave her. I've included links to as many recipes as I can, below. I hope you enjoy! You'll also see some fun pictures of the kiddos working throughout the week. 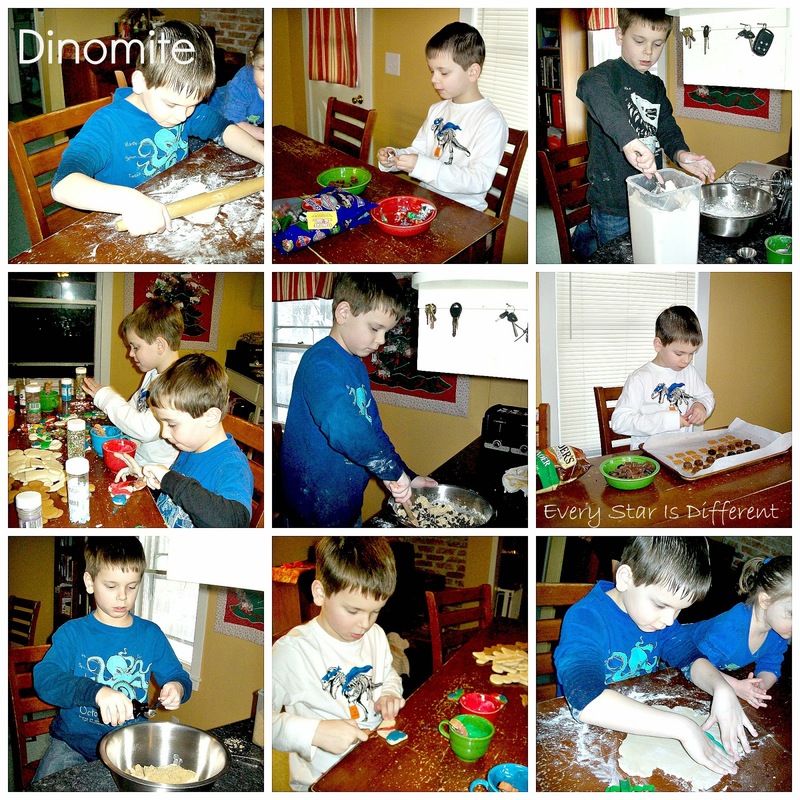 It didn't occur to me to take pictures the first two days we baked, which is why there are less pictures of each kiddo, after Dinomite. To accommodate food allergies, coconut spread and/or oil was used instead of margarine or butter. Water was used in place of milk. Ener-G Egg Replacer was used in place of eggs. Nut free, soy free, dairy free chocolate chips were purchased for the Chocolate Chocolate Chip Cookies. Over the course of the week, we made 75% of our cookies. We're saving the rest for the week of Christmas, so we'll have plenty to snack on and finish our community helper deliveries. When Jason and I were first married, a woman in our church congregation spoke about a family tradition they had. 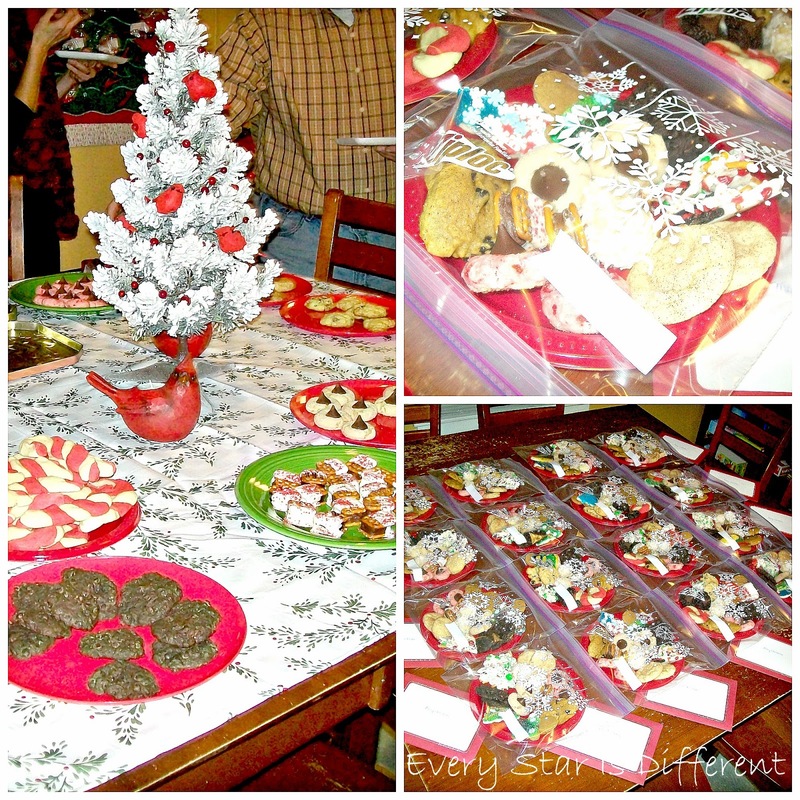 Each year at Christmas, their family makes and delivers cookies to ALL of their neighbors. This encourages the kiddos to not only become involved in the kitchen, but to show Christlike love and service to others, even those, they may not otherwise socialize with. She shared experiences about how this has affected their family's relationship in the neighborhood for good, and how her kiddos have learned to love and serve others. The very next year, Jason and I started this tradition with Dinomite. Neighbors who have lived on our street for several years, open their door with big smiles and thank yous. Those who haven't lived here long, are always so surprised that a neighbor would randomly give them homemade cookies and personally wish them a Merry Christmas. The process of getting all four kiddos out to deliver cookies is always quite the task. This year it they had a very hard time resisting the urge to look in people's windows and ringing the doorbells several times. It's all a learning process! Christmas is such a magical time of year! I love how it's a constant reminder of just how much learning can take place outside of our classroom walls. Beautiful! Love the concentration on their faces! Thank you! Yes, the expressions on their faces are priceless. You're welcome! I should have included a few other pictures if you wanted to see mess. ;) I'm so glad you're getting excited about working in the kitchen with your boys. Enjoy! Such a valuable lesson to teach children about generosity and kindness!!! priceless! thank you for sharing!!! What a wonderful activity!! Thank you so much for sharing it at my Virtual Cookie Swap Around the World! !